Toronto—The Toronto Maple Leafs got back in the win column after defeating their rivals, the Buffalo Sabres. Mitch Marner sealed the 5-2 victory for the Maple Leafs by scoring the empty-net goal at 18:03 of the third period. Saturday was the second night this week that the Toronto Maple Leafs and Buffalo Sabres played one another and the intensity was still there from Monday night's game. The Maple Leafs were victorious in the post-trade deadline game, so the Sabres definitely wanted to get even with their QEW rivals. John Tavares opened the scoring for the Maple Leafs at 4:20 of the first period after receiving a pass from Mitch Marner and batted away at a rebound that eventually found its way past Sabres goaltender Linus Ullmark. This was Tavares’ first home game since returning to the Nassau Colosseum on Thursday, where he was jeered by Islanders fans and defeated by his formers team. 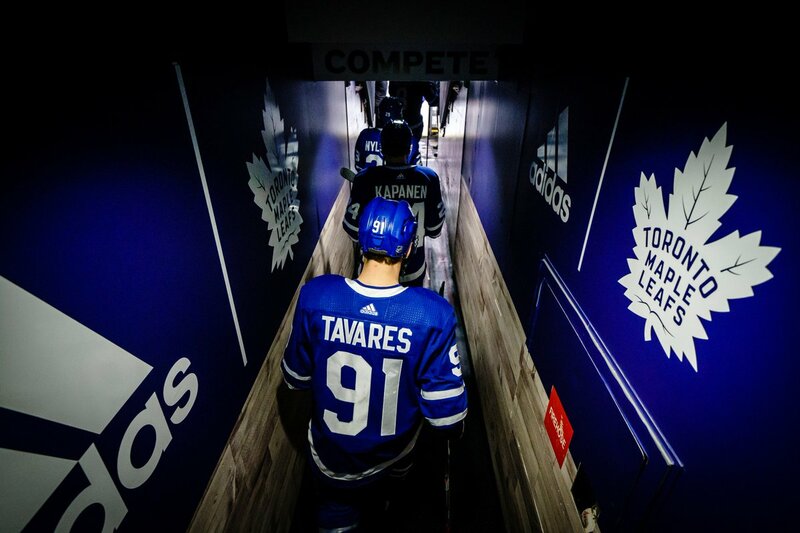 Before the game, Tavares was left alone at centre ice during the player introductions and received a loud ovation from the home crowd, which is a much better reception than he received in Long Island and a great moment for Tavares and the fans in attendance. Tavares’ early goal is great for his momentum and confidence because it put Thursday’s disappointing outing behind him and tallied his 37th goal of the season, which is an impressive achievement considering his career high is 38-goals and it ties his goal total from last season with 17-games still left to play. The Sabres would tie the game up shortly after when veteran forward Jason Pominville scored his 15th of the season on a goal that resembled Tavares’ goal over a minute earlier. The Sabres weren’t done there as they continued applying pressure and were able to take the 2-1 lead, when Conor Sheary took control of a bouncing puck in the Leafs zone and scored 12th of the season past Frederick Andersen off a quick release wrist-shot. Fortunately for the Leafs, they would tie the game before the end of the period following a wrist shot from Morgan Rielly deflected off Kasperi Kapanen and past Ullmark for his 20th goal of the season. The 22-year old will be an RFA in July and this season has been a strong indicator that he’ll be earning a significant bump in salary. Toronto forward Nic Petan made a great first impression in his Maple Leafs debut when he scored the go-ahead goal at 15:02 of the second-period. The Maple Leafs acquired the 23-year old from the Winnipeg Jets during the trade deadline in exchange for Par Lindholm. Petan hadn’t really been able to showcase his skills in Winnipeg, so the Leafs made a great low-risk high-reward trade and added skill to their bottom-six forward lines. Nikita Zaitsev also scored to extend the lead to 4-2 after his shot deflected into the Sabres net. Zaitsev has faced with a lot of criticism from fans and members of the media, so this was something positive for him going forward. The second period ended much more physically than the first; two of the most unlikely players to drop the gloves, Kapanen and Rodrigues, ended up receiving 5-minute fighting penalties after getting into a fight that ended rather quickly, Zach Bogosian connected with a big hit on Petan and moments later, Jake Muzzin would connect with a huge hit of his own on Sabres forward Zemgus Girgensons. The Maple Leafs are back in action on Monday when they take on the Calgary Flames.